In the west of Utah, there stands a 65 foot natural arch of entrada sandstoneLocally, it is known as the “Schoolmarm’s Bloomers” or the “Chaps,” but most people know it as the Delicate Arch. At one time, it was a sandstone fin. But over time, the middle eroded, opened like a mouth to the long red desert and mountains beyond. The first time I visited the Delicate Arch, I was driving cross-country with my husband Dan. We had been married just over a year, and in that time, I had miscarried two babies. I had given up trying to have children, and had suggested the drive to San Diego as a distraction for us both. I was pregnant when I first went to live in the States, but a few days after I arrived in the US, we found out about the miscarriage. We had been called in to the obstetrician’s office for my second ultrasound. If I hadn’t looked at the screen, I wouldn’t have seen that something was wrong. Later, in a poem, I described what I saw there as a “tiny moon”. It wasn’t moving, simply floating there: slowly circuiting the fist of the womb. Dan was looking at the screen eagerly and he still didn’t know. He hadn’t been able to come to the first ultrasound back in Britain. He had never seen the baby alive – the quivering that signals life. Nothing was moving on the nurse’s face. “Don’t look,” I said. But it was too late. Afterwards, I blamed the physician’s assistant who had called us in for an ultrasound without checking the baby’s heartbeat. We would never have been there, would never have seen the baby dead on the monitor, if we’d had a more experienced doctor. She looked at us awkwardly afterwards, made us stand foolishly in the hall while she looked up some pamphlets. We didn’t realize it then, but this wouldn’t be the last time that we lost a baby. After another failed pregnancy in the spring, I couldn’t bear the thought of spending the long, hot summer in the small Pennsylvania town where we lived. So we started out to drive across America. We had driven through the Mid-West, lolloping hills in Kansas, the dreary flatness of the plains and the Rockies rearing up from the even land like stern faces. By the time we reached Utah the land was changing again: red sandstone, ravines, boulders, pillars, fins and cliffs. By the side of the road, a sign that read NO SOLICITING was pocked by bullet holes. Like most visitors, we stayed in the town of Moab. There was a motel called the Red Rock Lodge decorated in the browns and creams so popular in the 1970s. The view from the window showed nothing but hot, red rock. “Like being on Mars”, Dan said as we crawled into bed. The next morning, we woke up at 5am and it was still dark. We drove into Arches National Park up the long, steep, winding road. You come to a plateau at the top and then the whole place opens out to a long, wide valley framed by sculptural shapes like long-bodied sentries. Near the car park is the old log cabin that belonged to the family of a Civil War veteran named Wolfe. He came from Ohio in the nineteenth century, lived out in the emptiness for a good number of years and then returned to where he had come from. After the miscarriages, I began to wonder whether I too should admit defeat and catch the next plane back to Britain. Sometimes, I even imagined that the land itself had a hostile aspect, deadly with its winter snows, tornados and devastating storms. Arches was different though. Not a hostile land exactly, but rocks that had persisted for eons and were quite indifferent to human suffering. Crossing the bridge over the Salt Wash, a huge crow swooped down and landed on the handrail, not so much threatening as curious. It held its ground as we passed it by. There was no one around when we started hiking. We clambered up the steep, tilted slab of sandstone, the sunrise radiating the Salt Valley. It took a good thirty or forty minutes to scramble up and we still couldn’t see the arch. At last we came upon a ledge with a sheer drop alongside, like a final challenge. On the other side, Delicate Arch rose up in the morning light. Directly in front of us was a huge, stone saucer as if a whirlpool had drilled down into the stone, and on the opposite side of the saucer was the arch. It was dizzying. I clung on to Dan as though I might fall and there was no sound but noise of swifts that nest at the top of the arch. 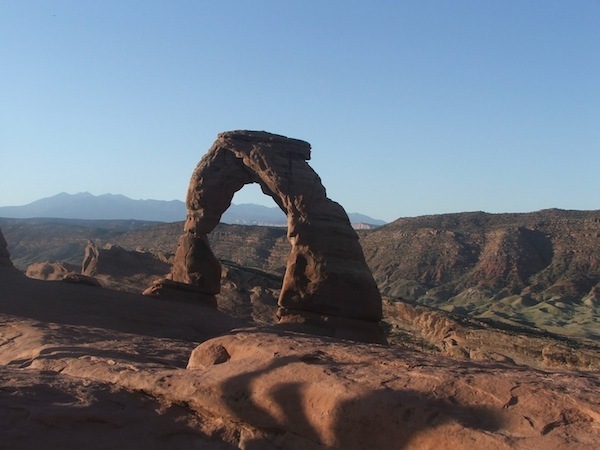 Writing in Desert Solitaire, the writer Edward Abbey sums up what is so remarkable about the Delicate Arch and the power it has over those who behold it. He writes: “If Delicate Arch has any significance it lies, I will venture, in the power of the odd and unexpected to startle the senses and surprise the mind out of its ruts of habit, to compel us into a re-awakened awareness of the wonderful – that which is full of wonder”. Seeing the arch so suddenly was wonder-full. But what is it about unexpected empty space that is so beautiful? Perhaps it signifies openness – a space that invites another in with generosity and selflessness. Or maybe it’s just that emptiness conjures the spaces that most need filling in our own lives. Those things that we most desire and cannot have. The people we have lost. The aspirations dashed. Failures that we lie awake at night regretting. Perhaps above all, it is lack made beautiful. Then there’s the fact too that the Delicate Arch will one day collapse. Like a beleaguered elder, it stands against the elements, but nothing lasts forever. Thinking these thoughts on the day of my visit, the O of the arch began to look like a cry of pain, and the legs braced against the wind evoked stoic determination. But there is always the need to humanize the land, to invoke a life or personality that never existed. I thought at last that there was nothing but stony silence and indifference in the red rock arch. It’s hard to explain exactly why, but sitting by the Delicate Arch that morning, I finally felt relief, as though a huge grief had been lifted. When we drove back into Moab later, we remembered that it was the 4th July, American Independence Day. People were putting up flags or red, white and blue decorations. Back at the motel, we threw together our belongings and drove back into the emptiness of Utah desert. Out there, beyond the narrow problems of a few lives, we let the vastness of the red rocks fill us. As if a voice was saying that loss is inevitable, that it has existed since the desert came into being, and will go on existing long after the Delicate Arch is gone.